Mari Mahr is a brilliant artist of Hungarian origin who divides her time between London and Berlin. Too gentle a person ever really to push herself forward, Mahr has had the kind of career which is faultless, but not really very visible. No longer a young woman, she remains insufficiently appreciated by a large factor. She works in relatively small series, often about her family, occasionally about figures of more public standing. In series after series, she has produced works of astute elegance seeking to situate her own affective existence among the objects of affection or culture around her. Her hallmarks are exquisite delicacy of psychological enquiry, matched and made visible in exquisite delicacy in the photographic object. By quality of work, she is one of the very great artists of recent years; by the amount of limelight shone upon her, almost invisible. “In the very last scene of a documentary movie, an old woman climbs a ladder all the way to the top of her house. I was impressed by the strength and charisma of such an old woman and decided to find out more about her. I learnt she was partly Hungarian, but what is more important I absolutely loved how her career came about, the way she made her choices, how she chose her men, how she made situations awkward for herself, painting away when it wasn’t a womanly thing to do. It sounds simple, and so perhaps it is, once you’ve done it. By making the stagey elements of her pictures completely apparent, Mahr let us know immediately that we weren’t looking at fact. Every standard picture element is up for revision: scale, perspective, narrative… this is a complete taking of control by the artist of those things which more normally constrain photographers. 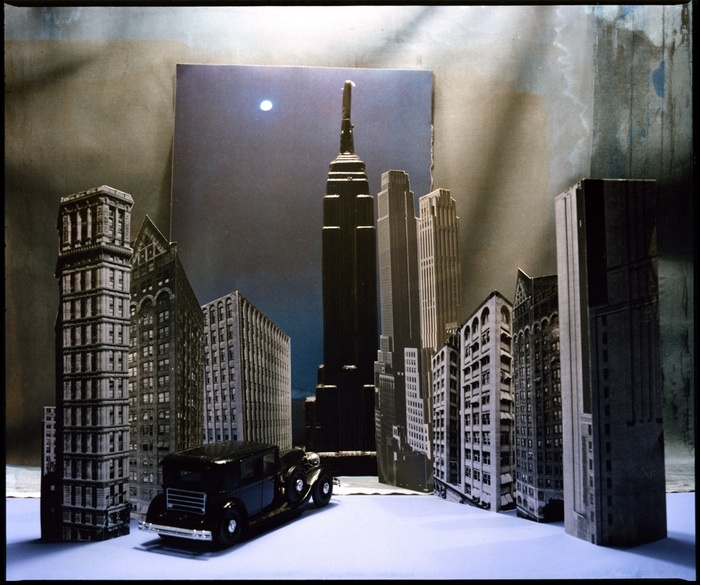 The obvious edges and folds, the block colours, the ultra-plain symbolic elements (skyscraper, cow, adobe, car, flag…) give the clues to a reading of O’Keeffe’s story which is both heroic and curiously domestic in scale. What results is a tribute and a separate work in its own right. Mahr has admiration and respect for O’Keeffe, and a point of humour about her, too. 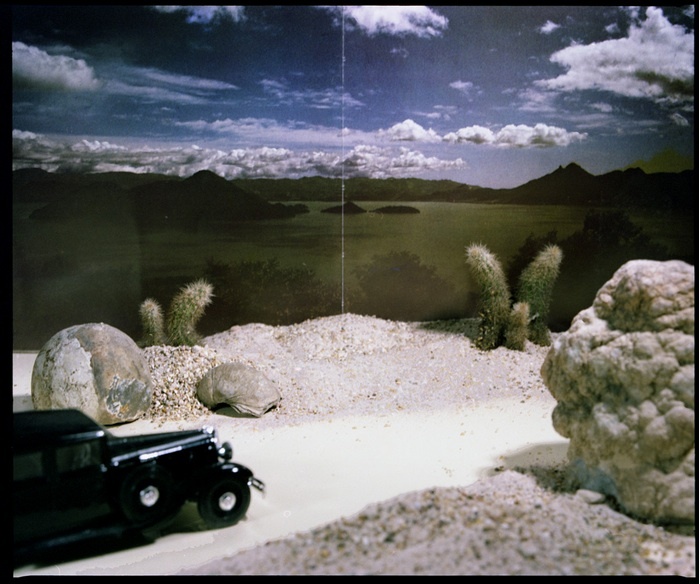 These are variants of collage, set design, maybe diorama. A few recurring themes make them understandable as music. They’re lovely as little post-cards, and sensational as the chapters in an episodic biography. They’re anything you like except flat photographs. No matter that it is little known; this is one of my great series. This is a non-review of a show which may be good or bad, but which contains some things I like very much and which Londoners don’t get to see all that often. 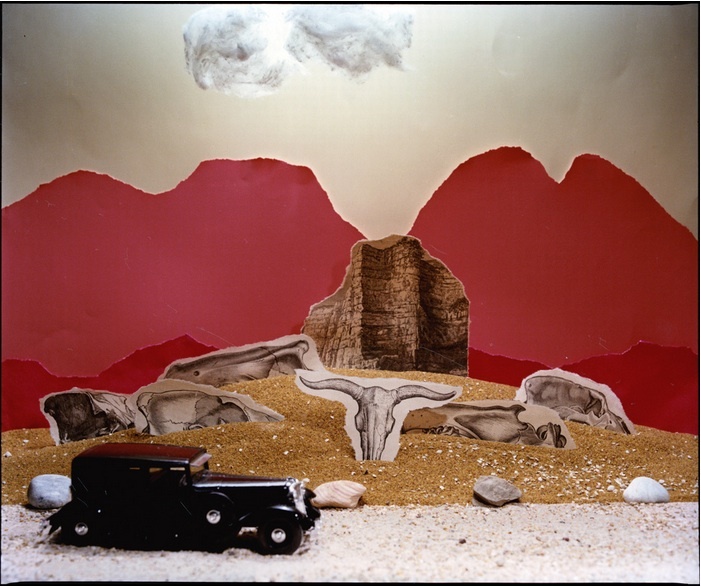 It’s not a review partly because so very much photography, for a hundred years and more, has been about marginal spaces and marginal experiences. 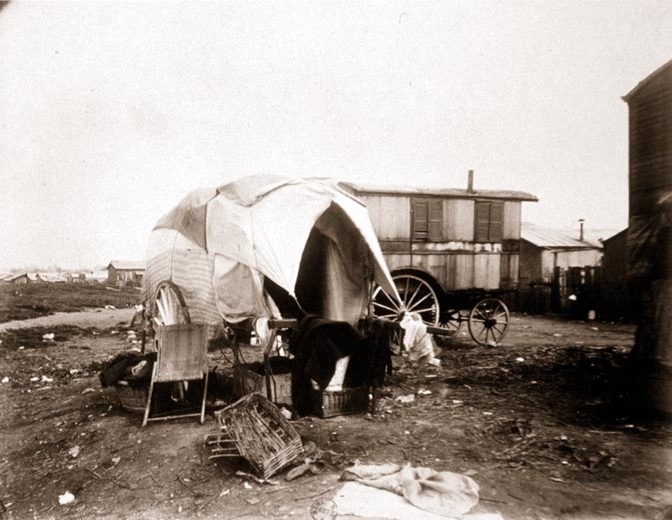 Atget was working in La Zone – the area cleared in front of the fortifications of Paris originally to give an open field of fire, in which a mixed and poor population lived at the end of nineteenth century and the beginning of the twentieth – at least a hundred years ago. Photography has loved the margins of society, and still does. Still. I don’t have to review something to enjoy it. A couple of platinum prints from Catherine Opie’s Freeways (1994). Beautiful little exercises in a very traditional kind of modernism, surprising for the artist. The fact that they are small pictures is important. So, too, the way they look like pictures of monuments which have lost their function. Photographed like this, you can’t see how to get up to these things, nor any cars, nor any real purpose. They’re like Stonehenge, obviously for something, but it’s not clear what. If form needs perfectly to follow function, then motorway flyovers do that to a T.
I saw recently another collection of pictures of bunkers of the war of 1939 (by Marc Wilson, from his series The Last Stand); almost indestructible concrete structures, but built in a hurry on cheap foundations. By now, still intact, they’re toppling quietly over. There are lots of photographs on this general theme, of the relationship between the structures we make and the lives we lead. Catherine Opie’s flyovers are still in use, but it’s never too early to ask what on earth we were thinking of. Look at that little gable, in the middle at the bottom. That little bit is the only bit at human scale. Five pictures from Keith Arnatt’s Area of Outstanding Natural Beauty. These were brilliant things, made in the early 1980s, much influenced by US photography, itself much influenced by a certain kind of environmental thinking. Arnatt was a conceptual artist at the time: but he wasn’t simply ironizing in the Wye Valley near where he lived. It’s not just that we dump garbage in beautiful places, or build wire mesh fences. It’s not even that we make a mockery of the whole history of the sublime, of the ‘green and pleasant land. Arnatt was making the point that sometimes it takes a photograph to see stuff. Just as photography showed years ago that it could expand vision by enlarging greatly or by slowing time, so more recently it has been shown to expand the consciousness that lies within vision. 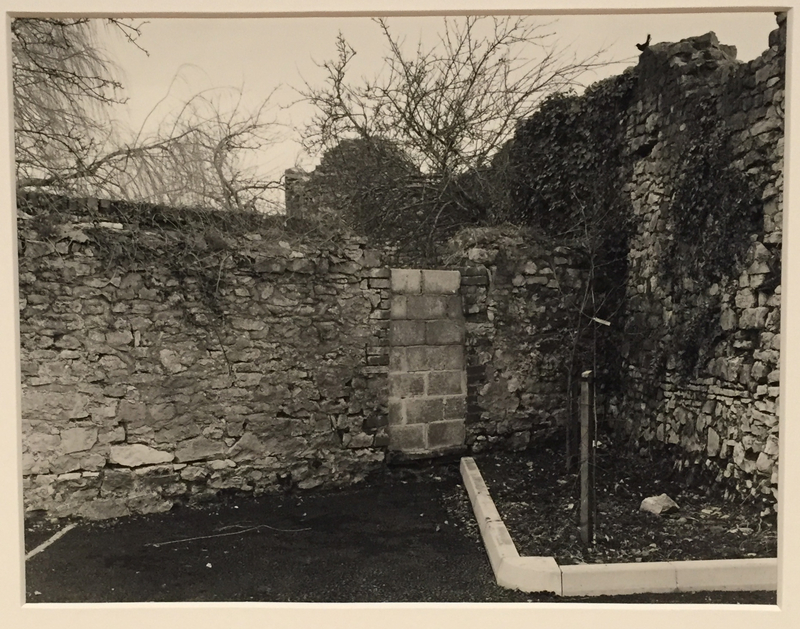 Arnatt saw a lost little tree – isolated from the bigger trees beyond like a sad animal in a zoo – in the corner of a tarmac car-park, hemmed in by cheap kerbstones. He saw the doorway coarsely breeze-blocked closed, in overt insult to the subtler material of the old vernacular wall around. And he saw that black bird (I daren’t write blackbird, because I don’t think it is) high on the wall, as symbolic as Masahisa Fukase’s terrifying crows from another place and another time. We don’t see any of this stuff until a photographer freezes it for us, on the microscope slide of light sensitive paper. Five various pictures (of about 1970) by Ralph Eugene Meatyard, late-flowering American Surrealist, an optician from Lexington, Kentucky. What to make of Meatyard’s saga of LucyBelle Crater whose gaudy horror mask contrasts so strongly with the friendly all-American life she leads? 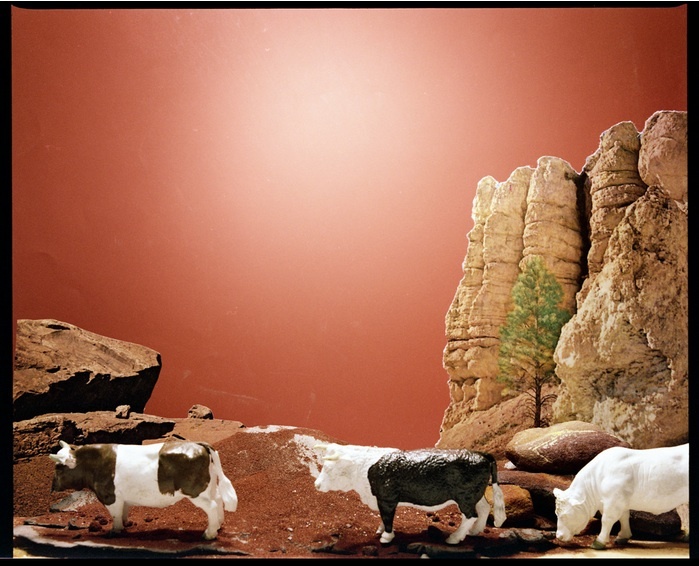 It’s standard to talk of Meatyard almost as an outsider artist, self-taught, unconnected, uninfluenced by the currents of art history. I happen to think that doesn’t hold water, for a specific reason: Meatyard’s photo buddy at the Lexington camera club was Van Deren Coke, a hugely influential historian and teacher of photography, director of the San Francisco Museum’s department of photographs from 1979 to 1987, and before that head of the school of photography at the University of New Mexico, at Albuquerque. Whatever else Meatyard was, with a friend like that, he was not a naïve photographer. LucyBelle is a Diane Arbus heroine if you like. She’s connected to all sorts of work with dolls and masks, from Hans Bellmer to Cindy Sherman. There’s plenty of writing on Meatyard’s influences, to him and from him. But maybe LucyBelle is just like all of us: there’s stuff in her expression which she doesn’t control, and stuff behind it that we don’t see. 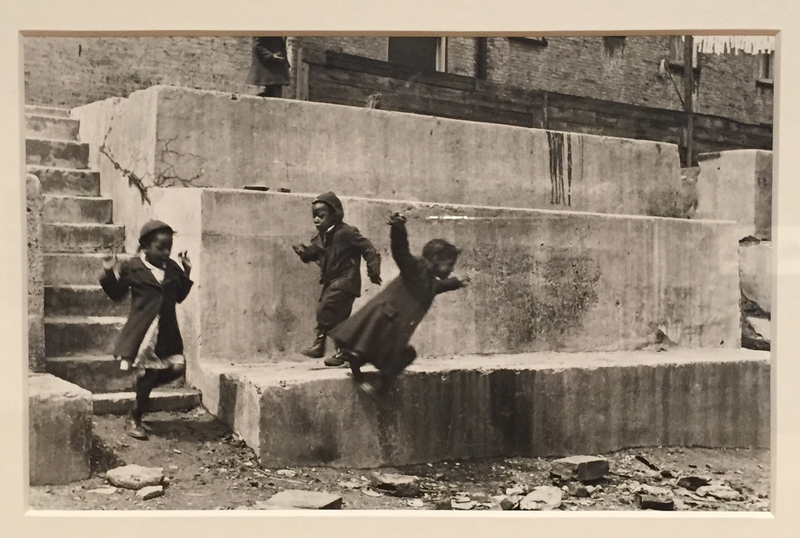 Two prints by Helen Levitt, from New York in 1940. Three children dance in a circle in winter. The giant staircase they’re on was not built for human strides: they have to fly to get off it, and they can. There’s a human-scale staircase attached, though, and a little line of laundry high in the corner of the picture reminds us that people keep on getting by, even when they can’t fly. This gorgeous composition matches all the great instances of movement in photography. If Cartier Bresson’s Aquila Degli Abruzzi is a stately minuet, then Levitt made a Ring of Roses. I keep having to blink to stop seeing it as a time-lapse, in which it would be the same child seen three times whirling around. Every other picture here I’d seen before. But this one I think not. I find it hard to imagine I could forget it. Grubby urban dust and brick and rubble, obvious poverty and hardship, not merely cheered but enlivened to a perfect symbolic demonstration of hope and promise. There are other such pictures. I offer you Roger Mayne’s great series of goalkeepers leaping about in the streets of North Kensington. It’s not a contest. There are no points. But this little Helen Levitt is a miracle by any standards. All of these things come from just one section of an exhibition, called Edgelands, curated by Ben Rivers at the Camden Arts Centre and on show until 29th November 2015. The show contains much else, notably Rivers’ own films. It is good or bad. But it contains some little photographs which you’d be mad not to take the chance to see. The show will certainly run until the end of May; actual final date yet to be decided. This announcement only appears here because the opportunity to put on this show came very late. I have been given the chance to use a small university space in a building on the edge of Kemp Town in Brighton, and the chance is too good to pass up. If you’re in Brighton for the Fringe, add a really remarkable exhibition to your plans. The public opening is on 19th, and I’d like as many people as possible to be there. I’m frank to say I want to show that there is appetite for really good photography in Brighton, a place with surprisingly few galleries. Spread the word, and come on 19th May. My little show is of vintage pictures by Mari Mahr from the 1980s. 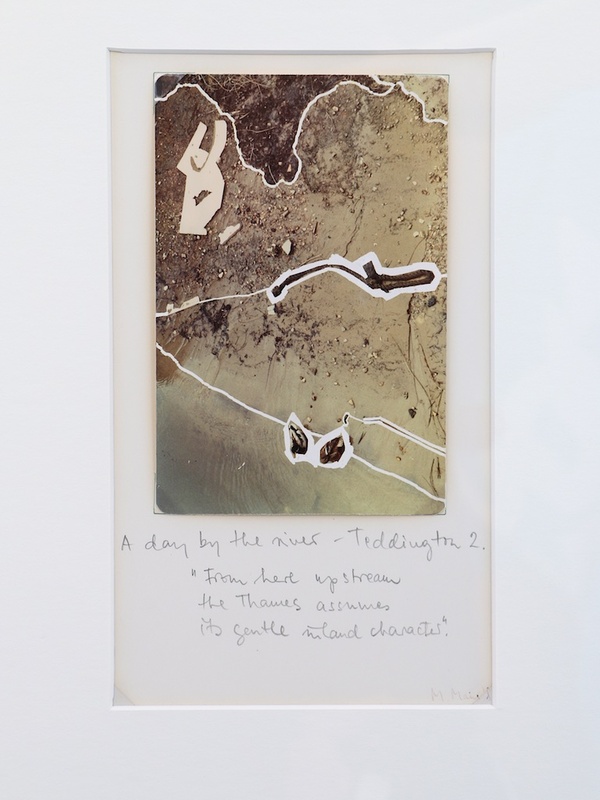 It is centred around an amazing series called A Day by the River. These have never been exhibited before, a survival of a set of vintage C-types from 1980 itself, when Mari Mahr was just beginning to get confidence in her techniques and her way of seeing. Improbably based on a London Transport leaflet on the river-side pleasures to be found to the west of London, these little prints are a lot of things at the same time. They are dreamy meditations on walking. My impression is that Mahr did not know London well in 1980 — she’d arrived only a few years before, after all. She had taken a course at the Polytechnic of Central London to widen her vocabulary from the photojournalism she had practised previously, and presumably needed processing time to digest a new city, new worlds, new habits. So she walked. Many artists walk, and not just the Francis Alys ones or the Richard Long ones who turn it into a ‘formal’ part of their practice. Mahr is not an impetuous artist; her concerns have always been about how emotion and memory and reactions to things combine in a person to make the character and the culture that they have. Walking is the natural way to let those complex ingredients mix. 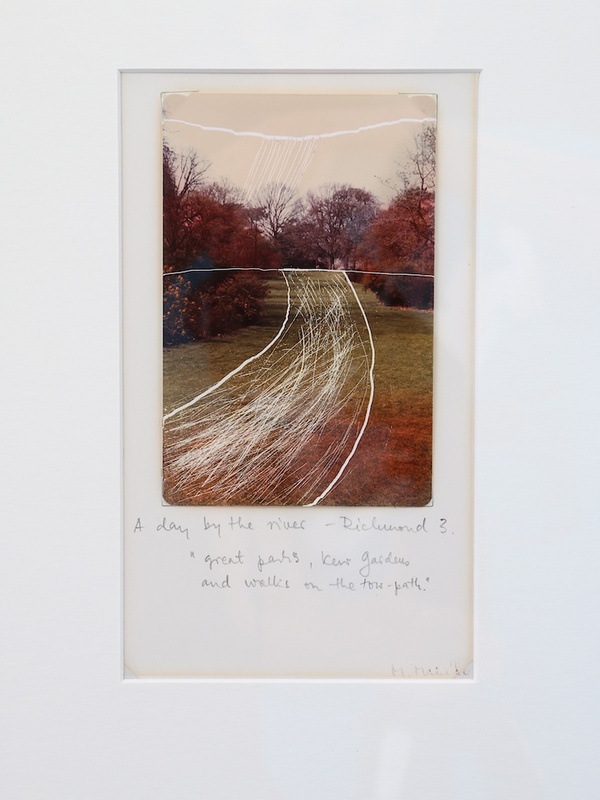 Many years later, at a time of great personal sadness, she made series which are more formally identified as ‘walking series’, but A Day by the River is not. It’s full of paths and has the lovely shifting focus from tiny details seized en passant to the bigger milder washes of sky and water. It may have been slightly melancholic — Mahr deals in melancholy like a country and western singer, as an inescapable part of the human condition — but it was lyrical, too. I imagine her swinging slowly along the towpath, dangling a camera on a strap and allowing a bucolic or georgic mood to wipe away the more urban one she had left behind for the day. It’s also a series of considerable technical invention. 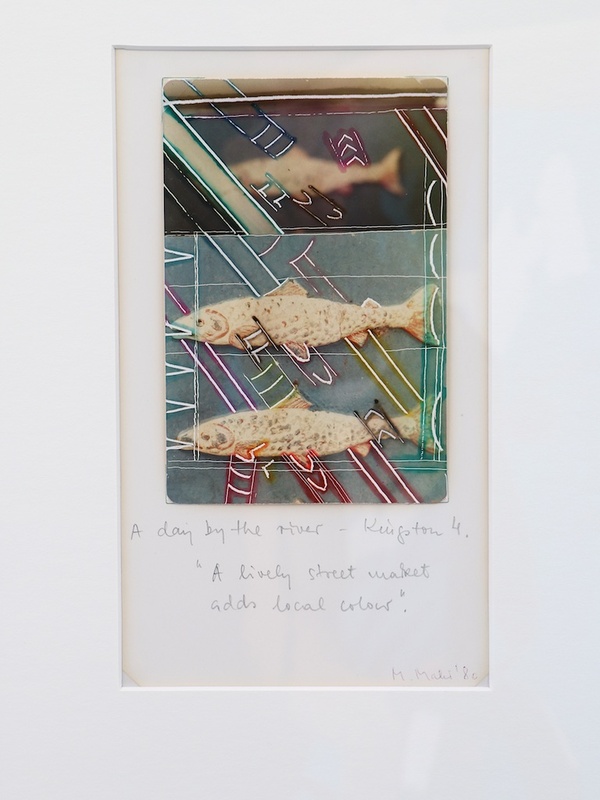 Full of complex overlays of work on both print and negative, these are pictures which would in another time have been described as objects of ‘vertu’, the word from which we get ‘virtuosity’. They are tiny little pieces of marvellous skill. It sounds odd to call a row of faded C-types jewel-like; but that’s what they are. Mahr reclaimed the photograph as an object of craftsmanship. 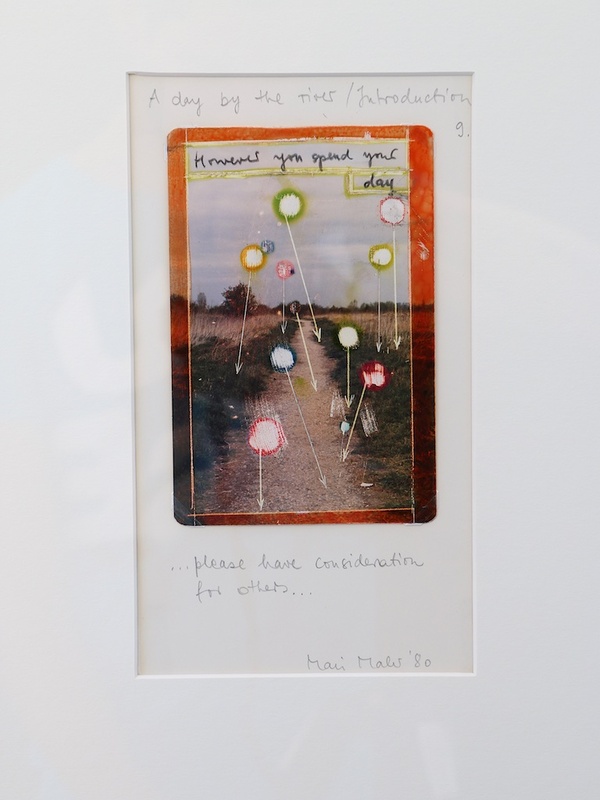 She layered her pictures with scratching and hand colouring and bits of collage. It was experimental, but one glance at the series will tell you that it was already the finished mastery of a great communicator. I first saw these pictures before I’d met the artist; I knew right away that she was more interested in the poetic aspects of life, the unspoken and perhaps unconscious than she was in fact. And so it proved. If you can make it to the show, you will see that the numbering of the series is not quite consecutive. It seems likely that this near-complete series is all that survives. Twenty little prints in all. Twenty fascinating insights into the developing mind of an artist already then well set on her way. The show also includes one single picture from the Georgia O’Keeffe series, which I wrote about in the Financial Times some time ago. ” Mari Mahr is a brilliant artist of Hungarian origin who divides her time between London and Berlin. Too gentle a person ever really to push herself forward, Mahr has had the kind of career which is faultless, but not really very visible. No longer a young woman, she remains insufficiently appreciated by a large factor. She works in relatively small series, often about her family, occasionally about figures of more public standing. In series after series, she has produced works of astute elegance seeking to situate her own affective existence among the objects of affection or culture around her. Her hallmarks are exquisite delicacy of psychological enquiry, matched and made visible in exquisite delicacy in the photographic object. By quality of work, she is one of the very great artists of recent years; by the amount of limelight shone upon her, almost invisible. It will be apparent by now that I am a fan as well as a critic and curator of these pictures. They are fantastic, and it is a shame that they are so little known. To put it quite plainly, I am proud to find even a little space to show them, and hope that as many of you as possible will crowd the place on 19th May in the evening. It’s terribly short notice. Never mind, spread the word by the miracles of Web2.0, and the effort won’t be wasted. I liked these very much at the Format Festival in Derby, running in March and April 2013. In humdrum fact, if you can’t quite identify them, they show fingerprints and hand marks on the rear doors of Ford Transit vans. People who are reading this from outside Britain may be mystified, so it is worth explaining that White Van Man became a stereotype of all that was rude and boorish and xenophobic about the British working man. He was a kind of recidivist Thatcherite, not the self-interested bourgeois that Baroness Thatcher thought she was addressing, but the thuggish know-nothing she appealed to in practice. The idea was that any lout could set himself up in business if he could only equip himself with a van: no skills or aptitudes needed. The Sun newspaper, itself the natural reading of White Van Man, ran a column for some years in which (real or imaginary) White Van Men sounded off about the topic of the day. White Vans became a staple of comedians and sub-comedians of the Top Gear kind. Bores and pundits on the radio and TV routinely generalised (often in incredibly ignorant and prejudiced ways) about what White Van Man thought or felt or did. So it is witty of James Newton to have sent all this snobbery packing. In less humdrum ways, these become quite evocative. They are a merciless send-up of Alfred Stieglitz’ Equivalents, for a start. Stieglitz was not really pretentious. He didn’t mind a bit of urban squalor at all. He just came over a bit that way when he turned his camera up to the clouds. Here he is at the end of a piece called How I Came to Photograph Clouds ( The Amateur Photographer & Photography, 1923, Vol. 56, no. 1819, p. 255. ): “My aim is increasingly to make my photographs look so much like photographs that unless one has eyes and sees, they won’t be seen — and still everyone will never forget them having once looked at them. I wonder if that is clear.” Well, actually, Alfred, not very, although I think I’m trailing along some way behind. More often than not, though, Stieglitz was on the right side. When it mattered, his opinions were both plain and sound. “Seeing needs practice — just like photography itself.” He put that it into his “Twelve Random Don’ts”, published in Photographic Topics 7 (January 1909), p. 1. Both of these quotes from Stieglitz, by the way, are here thanks to the fine critic of photography A.D.Coleman, who put them on his Photography Criticism Cyber Archive, from where I copied them some time ago. Well, James Newton has found a piece of equipment that goes back all that way. It is still the hands which have to get in the van at some point and get a hold of something. It is by the hands that Sherlock Holmes could most certainly tell the profession of everyone that he met. White Van Man might not know what to do with an Olduvai pattern handaxe, but he has the same basic obligations. Handaxe from the Olduvai Gorge. The second sub-group these deceptively simple little pictures belong to is more obvious: they are plainly a Typology (I’ve given it a capital because it’s a word that seems to occur mainly in the context of endlessly similar photographs). We know what a typology is: the visual identification by photographs of some recurring pattern not deliberately imposed by any author, but that crops up as the shared solution of a given set of variables. Crowned head typologists, of course, were Bernd and Hilla Becher, who showed that industrial structures needing to achieve the same compromises between function and cost often took on remarkably similar forms even when no architect was involved. But typology has become a little corrupted in photography: too many photographers have trawled the world making the same photograph again and again without really stopping to consider which variables they had found or whether they were worth finding. It is a mistake, for example, to claim to make typologies of people in uniform. The reason those conform to type is not because they represent equal solutions to parallel problems, but because somebody designed the uniform to make them look the same. Some of what Sander did, some of the Bechers, many others are wonderful eye-opening discoveries of pattern and conformity. But that shouldn’t give idiot photographers a licence to pump out photographs by formula: heaven help us, there are too many pictures in the world as it is. But James Newton has found a real typology: these little marks are not planned, and they are telling. The smoky patterns could easily be a captured representation of the pollution that all White Vans cause. Indeed, in perfect fact, they are. For the grime on the door panels is certainly for the most part the particulate matter that all those diesel engines throw into our city air. We live in a system that requires the rapid transport of materials and goods to satisfy absurdly urgent needs for consumer gratification. It is not at all rare in Britain for a certain kind of person to change their kitchen every two years. And to do that, they summon fleets of White Vans hither and yon. It’s fun to find all that in handful of pictures of dirty doors. James Newton can be found via www.highchair-editions.co.uk/, where he sells prints and books of photographs, including one of the To / From series. These pictures should be snapped up immediately by anybody who likes the way photography can be both exquisitely particular and abstract at the same time. I hope they look lovely printed in the book (I haven’t seen them) but I would really like to see them printed as photogravures. There is something about that register of flat dirty greys which just begs for top-class photogravure printing. Stieglitz would have understood.